Tag Archive | "Social Pension Program"
A social pensioner emotional to receive her cash pension. 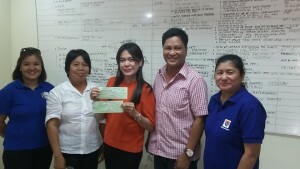 CAGAYANCILLO, PALAWAN – The Department of Social Welfare and Development (DSWD) MiMaRoPa recently conducted payout of monthly cash grant to 56 Social Pension beneficiaries of the municipality. The beneficiaries each received a Php3, 000 stipend for the months of January to June. Regional Social Pension Program Focal Person, Nerissa Nario facilitated the payout with the help of the local government unit and Municipal Social Welfare Officer Honey Rose Bungalso-Cesumision. Nario said in an interview that “Social Pension is a government program that provides Php500-monthly stipend to indigent senior citizens aged 77 years old and above.” She also stated that the house-to-house payout is also a way to verify the improvement in living condition of the beneficiaries. Social Pensioner Adelina Cayapas, 80, expressed her gratitude to the program and said that the amount she received will buy her medicine and groceries.